Northland’s subtropical peninsula, indented with beautiful harbours, bays and estuaries, occupies the northernmost edge of New Zealand – where the Tasman Sea and the Pacific Ocean join. It was also an early meeting place of Māori and European, and the landscape is enriched with signs of a shared history. Northland stretches from north of Auckland up to Cape Rēinga, at the very top of New Zealand. It has a warm, sunny climate. You are never far from the sea in Northland. 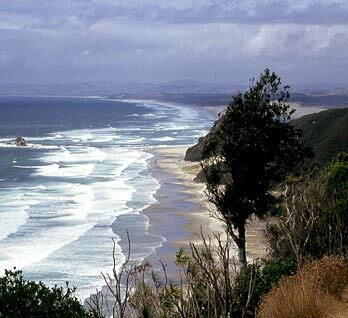 The west coast is quite straight, with huge sand dunes, and wide harbours at Kaipara and Hokianga. The east coast has many little bays and beaches. Northland has 1,700 kilometres of coastline. The red-flowering pōhutukawa blooms by the sea in summer. The clear waters are home to colourful sub-tropical fish. Rare birds such as variable oystercatchers and New Zealand dotterels gather on the shoreline. In the forests there are huge kauri trees, as well as native geckos, snails, bats, and the unusual Hochstetter’s frog. The earliest settlers were Māori arriving in canoes from Polynesia. It is said that at Cape Rēinga the souls of those who have died travel back to their homeland, Hawaiki. Many European traders and whalers came first to Northland, and so did the Christian missionaries. Today you can visit the sites of Māori fortified villages, stone buildings, and historic churches. Waitangi in the Bay of Islands is where the Māori and representatives of the British monarch signed the country’s founding document, the Treaty of Waitangi, in 1840. From the 1840s onwards, mainly English and Scottish immigrants arrived in Northland. Many cleared the forests and started dairy farms. From the 1880s, settlers arrived from Dalmatia, in Europe, to dig for kauri gum. In 2013 the population was 151,692, and nearly one-third were Māori. The main tribe, Ngāpuhi, is New Zealand’s largest. Many people leave to find work in Auckland, but others stay in Northland for the climate and easy lifestyle. Whāngārei is the main centre. Much of Northland is isolated and rural, far from city life. Small townships have lively communities, with events such as surfing competitions and arts festivals. Farming, forestry and manufacturing are important, and the Marsden Point oil refinery near Whāngārei produces most of New Zealand’s petrol. Tourism is a major industry. Every year thousands of visitors enjoy fishing, diving, nature walks, and other activities.